Dr. Makapugay co-founded GI Pathology in 1995 with Dr. Dean. She has been instrumental in managing the company’s high growth rate while maintaining its superior quality and service levels. Originally from the Philippines, Dr. Makapugay earned her medical degree from Far Eastern University in Manila. She then completed a five-year residency in Anatomical and Clinical Pathology at the University of Tennessee in Memphis. Following her residency, Dr. Makapugay completed a year-long fellowship in gastrointestinal and liver pathology at Baptist Memorial Hospital and the University of Tennessee under the direction of Dr. Dean. During the period of her fellowship, Dr. Makapugay authored a landmark article on diverticular disease-associated chronic colitis. She is a member of the ACG, Crohn’s and Colitis Foundation and CAP. 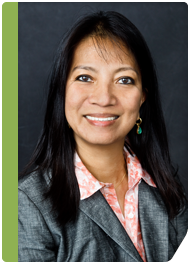 She has over 14 years of experience in gastrointestinal pathology.